These raw truffles taste pretty much like a candy sweetened by dates. They are rich, creamy, and so delectable. There’s no melting ganache when you bite into these. BUT, but my friends, you will experience a moment of sweet caramel-y bliss as these truffles melt on your tongue. If you’ve ever made raw treats with dates, you know what I’m talking about. If you haven’t, you’re missing out. Seriously. I’m extremely selfish with food. I will buy or make treats and then hide them from my husband. I feel completely justified though because my husband tends to devour everything in sight. He never used to suspect that I would be hiding food from him, until he found a few chocolate chip cookie bars tuck away in a slow cooker. So now he always checks the pressure cooker for treats. Fortunately, he hasn’t thought of checking the vegetable drawer of our fridge, which is where I hid these raw truffles. Yes, I’m a joy to live with. There are just some foods that I have a really hard time managing to eat in proper portions. A while back it used to be nut butters. All nut butters seemed to have this spell on me. I could never eat just the recommended serving size of two tablespoons. Something about eating a spoonful after spoonful was so satisfying, so delicious, and so dang hard to stop! Well, my newest obsession are these truffles. I have a few of these raw truffles every single day before my run and/or to re-fuel right after. 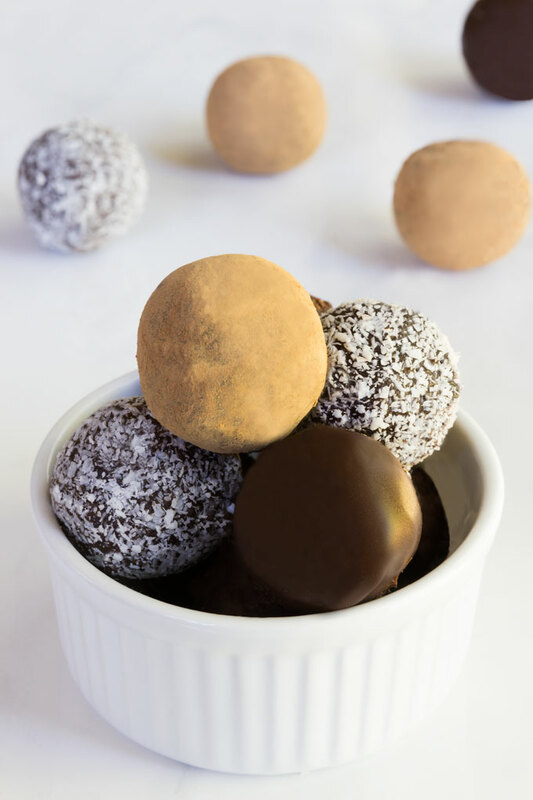 But even if working out isn’t your thing, you can enjoy these truffles as a pick-me-up afternoon snack or a simple dessert. I don’t know who to give credit for the 2-ingredient-date-based-truffle idea because there are numerous versions of these all over the internet. But I can’t thank the person who invented this combo enough. The sweet dates compliment the rich cacao powder and/or the fruity acai powder really well, and the various coatings trick you into thinking that you’re having a real special treat. The key ingredient in these raw truffles are soft dates. There are many varieties of dates harvested worldwide, but the Medjool dates are one of the two of the most commercially produced varieties in the North America. The other most commonly produced are the Deglet Nour dates. For this recipe, I would recommend sticking with Medjool dates because of their tenderness, juiciness, sweetness, and a deep caramel-like flavor. They should be slightly glossy with no crystalized sugar on the surface. They actually taste like a candy, but in an unprocessed sort of way. I always recommend organic, although I understand that it’s not always an option for everyone. If Deglet Nour dates is all you have, soak them in warm water first so they soften up. Use as little water as possible because the soaking water can dilute the dates sweetness. You’ll also need to dry off the soaked dates before adding them to the food processor so the truffle mixture doesn’t end up being too runny. As you can see, there are many things you can add or roll the truffles in. A powerful food processor is a must for this recipe. While basic cutting or chopping doesn’t require too much power, other functions like dough mixing or pureeing do. If you don’t own a food processor and are thinking of buying one, go for the best one you can afford. You don’t usually buy food processors all that often so a powerful food processor is worth the investment. The food processor I personally use and can’t recommend enough is the professional-quality Breville Sous Chef food processor. Once you have the truffle dough ready, the easiest way to handle it is by using your hands. Since the dough is very sticky, you might find that it’s rather difficult to work with. So before you roll the dough into balls, wet or oil your hands. I like to set a bowl of warm water nearby and wet my hands as needed. Allow the truffles to form a skin – if your truffle centers are too soft, they won’t stay round and intact when you dip them in warm chocolate. One solution is to let the truffles sit in a cool room for a few hours before dipping. You don’t want to use the fridge because it’s too cold. When you dip refrigerated truffles in warm chocolate, the chocolate coating is more likely to crack. Temper the dipping chocolate – tempered chocolate is smooth, shiny, snappy, and doesn’t melt at a room temperature. For tempering instructions, read how to temper chocolate. If you don’t have the time to temper chocolate, you can skip this step. But know that untempered chocolate needs to be refrigerated in order to stay hard and snappy. Coat the truffle in chocolate – drop the truffle center into the melted chocolate and push it gently under the surface of the chocolate. Using a fork, lift the truffle center out of the chocolate and let the chocolate drip off. You can also slide the bottom of the fork over the lip of the bowl and remove any excess chocolate. Then place the fork over a parchment paper-lined baking sheet or a plate, and tilt the fork so the edge of the truffle touches the paper. Smoothly slide the fork out from under the truffle. Allow the chocolate to set in a cool room. Trim – once the chocolate has set, you may notice small “feet” at the bottom of the truffles. You can cut the “feet” off with a small sharp knife. Just be careful not to touch the coated truffles in the process so you don’t end up with your fingerprints all over the chocolate. 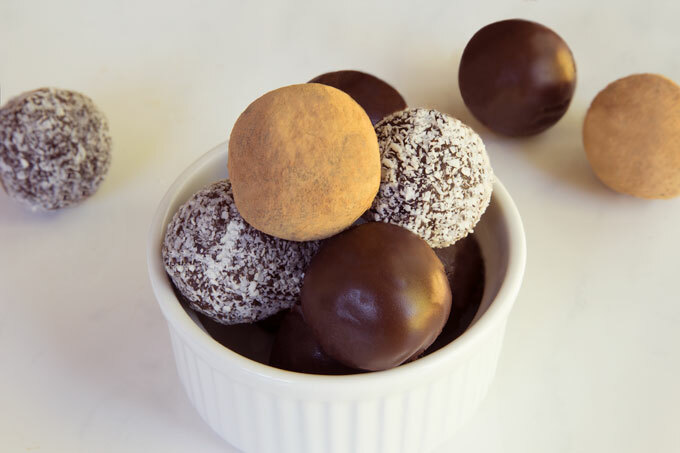 These raw truffles are rich, creamy, caramel-y and so delectable. 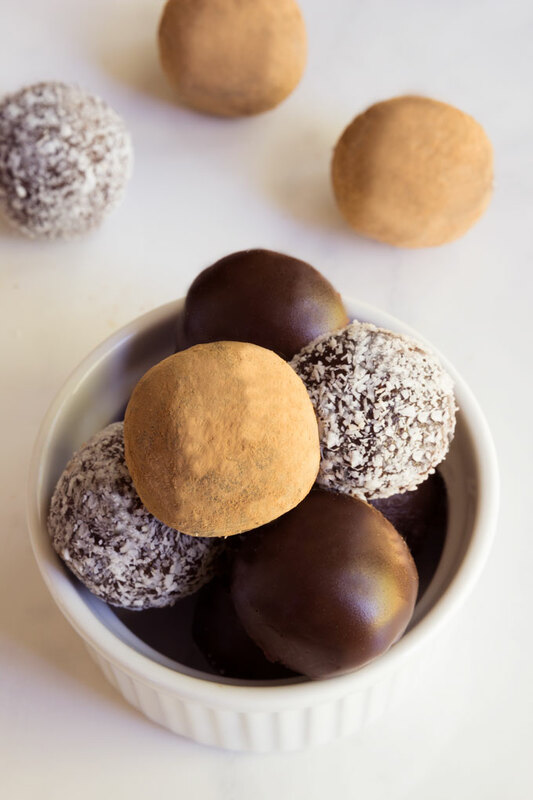 The sweet dates compliment the rich cacao powder and/or the fruity acai powder, and the various coatings trick you into thinking that you're having a real special treat. Into a high-speed food processor, add the dates and 2 Tbsp. (14 g) cacao powder or 2 Tbsp. (12 g) acai powder and process the ingredients into a very smooth paste. You might need to use a spatula to scrape the mixture down as you blend. Using a spoon, scoop out mixture and roll it into balls. The "dough" will be very sticky so wet your hands to make the rolling easier. Add 1 Tbsp. (7 g) of cacao powder/coconut/melted dark chocolate into a small bowl and coat the truffles evenly. Place the finished truffles on parchment lined baking sheet. Store leftover truffles in an airtight container in the refrigerator for up to 1 week. For longer term storage, freeze in an airtight container for 1-2 months. This recipe has been adapted from Rawmanda.